The house, which actually consists of two separate buildings, has a footprint of 107,8 square meters and is connected to mains electricity. There is a deep bore hole on the property which supplies lots of water both for domestic as for irrigation purposes. The property is located in a tranquil area on the outskirts of a little hamlet near Cernache do Bonjardim. There is good vehicle access to the property, which has a gated entrance. The main house consists of a rustic kitchen with a chimney to one corner, a living room and two bedrooms. The windows are single glazed aluminum, as are the doors. The roof is of recent built and there is a ceiling in pvc with wood optic. Two meters next to the main house there is a second building housing a simple bathroom, a storage room and a larger room which was used as a bedroom. The roof of this house is also in good state of repair. The plot of land which comes with this property is mainly flat, and boasts a good number of mature olive trees and a large nectarine tree. One small part of the plot is on the opposite side of the access lane the property is located on, here there are also pine trees and cork oaks. 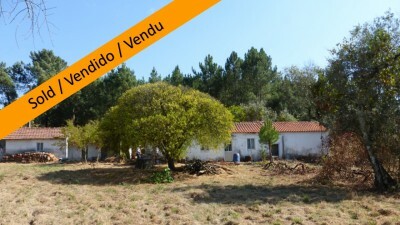 The property is five km from the center of town of Cernache do Bonjardim. The larger town of Sertã is around 12 km from the property. Sertã has several supermarkets, shops, restaurants, banks, schools, health centers, cafe bars, a very pleasant river side park and municipal buildings and is easy to access off the IC8 dual carriageway. The closest airport to the property is located at Lisbon, which is approximately two hours’ drive way. Porto airport is slightly further taking approximately two and a half hours. Both Lisbon and Porto airports are serviced by several low cost airlines which operated regular flights into and out of the United Kingdom and other European countries.